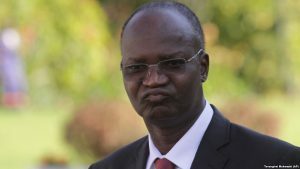 Higher Education Minister Jonathan Moyo’s plans to name a yet to be built university after President Robert Mugabe have been met with scorn by activists who feel the veteran leader has squandered a legacy he painstakingly built during the country’s liberation struggle. Moyo said the envisaged specialised skills university will assume the veteran leader’s name as he was an “iconic leader who has distinguished himself in the area of education”. The Tsholotsho North MP said this has been the case with other African countries that have named some of their learning institutions after their founding leaders. But Great Zimbabwe University history lecturer and Progressive Teachers Union of Zimbabwe (PTUZ) president Takavafira Zhou said it will not be befitting for a learning institution to assume the name of a leader who has destroyed his legacy by overstaying in power. “Naming a university after him will be palpably unfair and a monument of Zimbabwean injustice,” Zhou said. Zhou accused Mugabe of “presiding over the evils of terror and poverty” while his disastrous economic policies have consigned the majority to street vending. He said Mugabe was associated with tyranny, dictatorship, cronyism and economic decay and did not deserve any further appreciation than he already has. Former Zimbabwe National Students Union (Zinasu) president and now activist with the Zimbabwe Amalgamated Rural Teachers Union Pride Mkono also felt naming a high learning institution after Mugabe was repugnant. “It is the biggest insult that he who represents the maximum failure of any nation, from economic decay to educational collapse and that of every functional system, whose only heritage is the militarisation of everything including the sale of match sticks in this country has to have a university named after him. “It would be the biggest insult on any academics,” he said. Current Zinasu secretary general Makomborero Haruzivishe felt Mugabe’s name did not inspire any pride among scholars further rubbishing the Chancellor of all universities of dishing out a fake doctorate to his wife. “He has deeply corrupted any historical prospects through habitual violations of academic freedoms and total disrespect of academic principles,” he said. “His brutal regime has victimised student leaders, denying students freedom of expression, thwarting the freedom of conscience on the academia and awarding his wife, an academic and intellectual midget, with a PhD signified his total disregard of education and academic values both in his capacities of President of Zimbabwe and Chancellor of all universities. But Zanu PF legislator and party youth league secretary Kudzanayi Chipanga differed saying Mugabe’s legacy was already sealed as was shown by the respect he commands globally. “It’s now more than intact. President Mugabe is now recognised not only in Zimbabwe but in Africa and beyond. He is now a world figure,” Chipanga said, adding that Mugabe deserved every honour that has been conferred on him. Zimbabweans are not the only ones who feel their President has lost his legacy. Mugabe was in 2008 stripped of his honorary knighthood by former ally Britain after waging a violent campaign towards his re-election. A decision to name a Malawian road by then Malawian leader Bingu Wamutarika (now late) after Mugabe in 2012 elicited a strong reaction from the southern African country’s citizens who felt the Zimbabwean leader was not deserving of the honour because of his poor human rights record.